4th qualifying match of CLT20 2014 was played between Mumbai Indians and Southern Express at Shaheed Veer Narayan Singh International Stadium, Raipur. Mumbai Indians with help of LMP Simmons and MEK Hussey successfully chased given target 161 and won the match just in 16.2 overs. LMP Simmons was man of the match for his 76 runs of 51 balls. Earlier Mumbai won the toss and chose to field first and let Express to set target. Southern Express Bated well and with middle orders batemen good bating managed to put 161 runs for Mumbai Indians to achieved. MF Maharoof (41 runs of 22 balls) and MD Gunathilaka (30 of 23 balls) played well for Express. 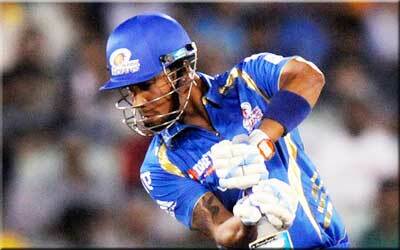 Following target of 162 runs Mumbai got solid start with LMP Sommins and MEK Hussay. Both played well and registered their half centuries as well. Before MEK Hussey got out on 60 runs both added 139 runs for the 1st wicket for Mumbai. Rest was done by skipper Pollard adn he smashed 20 runs of just 7 balls with 3 towring sixes and won the match in 16.2 overs with 9 wickets in hand. LMP Simmons declared man of the match for his 76* runs of 51 balls.